You can judge a first person shooter almost entirely on the strengths of its shotguns. A good video game shotgun is a bold and challenging weapon; a bad shotgun is a feather duster at a distance of more than a few feet. A good shotgun makes you feel like a champion, capable of taking on the world. A bad shotgun makes you wonder why you aren’t using another gun. This piece originally ran December 24, 2015. Shotguns originated with the blunderbuss, which was essentially a gun you’d load with junk. When you fired it, the junk would go everywhere and hit stuff. Not really accurate, but very powerful. Over the years, shotguns were replaced by rifles, which are more accurate. They saw a comeback during WWI, thanks to their effectiveness in trench warfare. One of the coolest things about shotguns is how they load. You’ve got your break-action shotguns, which split apart so you can stick a few shells in. If that doesn’t suit you, there are pump-action shotguns, with that classic “chk-chk” sound when you chamber a new shell. Then, of course, you’ve got the semi-automatic shotguns that fire with each pull of the trigger and even more crazy stuff like the AA-12 automatic shotgun. Some movies and games have tried a sort of flip-action shotgun, like Arnold’s shotgun in Terminator 2: Judgment Day, though that’s pretty unrealistic, even if it does look super cool. Shotguns have two main types of ammunition—shot and slugs. Shot are the little pellets that expand in a cone shape away from the gun, while slugs are single projectiles, kinda like a bullet. Shotguns are extremely powerful, but with shot, the energy is dispersed when the trigger is pulled is transferred to multiple pellets. Put simply, the shotgun will absolutely wreck a target up close, but shot is effective up to 40 or 50 yards. That’s half a football field. Slugs go even further, especially with rifled barrels. 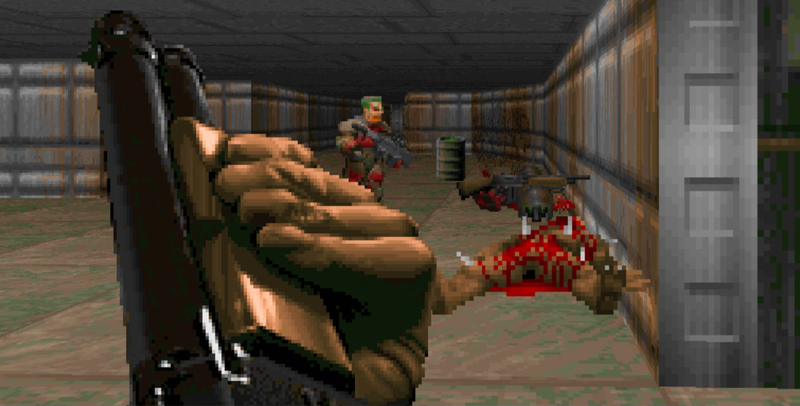 In 1993, id Software codified the basic shooter arsenal with Doom. In almost every shooter since, players find themselves with a pistol, assault rifle or machine gun, rocket launcher, plasma rifle, and shotgun. Plenty of games have tried to add their own distinct archetypes, but only the sniper rifle really seemed to stick. Pistols don’t pack much of a punch—they’re the early-game weapon, for the most part, unless you’re lucky and have something like Half-Life’s magnum. The assault rifle is sort of the lowest-common-denominator weapon. It’s got lots of ammo and works nicely at any range, allowing players to stay back and spray while feeling pretty effective. All you have to do is hold down the trigger and something will probably die. It’s a greenhorn’s gun, supremely easy to use with no meaningful drawbacks. Plasma rifles typically fire quickly and hit harder than assault rifles, but their projectiles move more slowly, making them easy for enemies to dodge. Rocket launchers fire even slower projectiles and carry very little ammo, but the high splash damage makes up for it. A properly-designed video game shotgun is relatively easy to aim, thanks to the weapon’s cone, and it becomes increasingly effective the closer the player is to the enemy. A well-designed shotgun encourages players to get up close and dance with their enemies. Bear in mind that, in a shooter, momentum is everything. Players want to be on the move. A shotgunning player can take out most foes in a single hit at close range, but requires two or three rounds at a reasonable distance. This is balanced with a slow rate of fire and magazine size of six rounds, giving the enemy time to fight back. One thing that shooters require to feel good is feedback. Feedback is an audiovisual response to player action. All games have it to some degree—look at the way enemies will often blink or flash when hit in character action games—but shooters require it a lot. A shooter game’s shotguns often provide the most gratifying feedback, because they’re built around the idea of brute force rather than precision. Enemies spurt sparks or blood, lurching back with each hit. Some die right away and go flying across the room. A shotgun gives you a sense that you’re feeling incredibly effective, which is exactly what shooters are supposed to do. You can judge a shooter by the quality of its shotgun, because the shotgun encourages the most dynamic, interesting, and mobile play while keeping itself fair with reasonable drawbacks. To top it all off, the shotgun often has the best, most satisfying response and always makes its players feel effective. I need to single out some of the best shotguns in history as a demonstration of how to do shotguns right. The Flak Cannon is one of the best guns in any shooter ever. It feels great to use, and its ammunition bounces off walls, which lets players pull off some cool, creative kills against enemies they might not be able to see. With the flak cannon, you always feel like you’re doing damage. There’s never a situation where you’re feeling like you’re carrying a feather duster with no range. If that weren’t enough, the flak cannon’s alternate fire has it double as a grenade launcher, which makes it a great panic button when you’re low on health and aren’t sure where your enemies are. 2. VK-12 Combat Shotgun, F.E.A.R. Shooters have barely improved since Monolith’s 2005 game F.E.A.R. This game was the peak of gaming hit feedback when it launched, and no one has approached it in the decade since. When you hit someone with the VK-12, they fly backward, ragdolling into the scenery. Some enemies simply explode in a puff of pink mist. When you hit something with a VK-12, the response is immediate and impressive. No gun rewards you for pulling the trigger as effectively as the VK-12 does. No gun puts as big a smile on my face. Part of the reason it’s so fun to go up against AI enemies using the VK-12 is that their damage output is halved. One of the problems I have with the Gnasher in Gears of War is that it’s not fun to defend against. By halving the VK-12’s damage from AI opponents, Monolith ensured it would feel incredible to use without feeling bad to encounter. Durandal, your boss-slash-nemesis in the Marathon games tells you that you shouldn’t try to comprehend the reloading mechanism of the WSTE-M. He’s right. All you need to know is that if you flip these shotguns like Arnold in Terminator 2, you’re going to feel very happy with yourself. They’re easily the most fun guns to use in Marathon not just because their raw power can harm even the toughest of foes, but also because of the wondrous, musical cadence of their reload. I debated with myself for a long time which of Doom’s shotguns would make the list, then realized that I make the rules. Therefore, this is a tie. Doom’s shotgun is great because of how its spread works. Up close, most of the pellets are going to hit a single target, and it’s going to seriously injure or kill an enemy. Further away, the pellet spread means you’re likely going to hit multiple targets, so the gun has utility at multiple ranges. Then there’s the Super Shotgun. One of the common pitfalls of break-action shotguns is that they’re seen as being so powerful that they have to have a short reload. Lesser developers turn their break-action shotguns into liabilities by making their reload excruciatingly slow, but Doom’s creators at id wisely keeps the reload speed of the Super Shotgun high to counteract the slow rate of fire, making it incredibly satisfying to use. The result is a gun that destroys anything in its path and sounds wonderful doing it. Bulletstorm was one of the best games that no one played, because it had some of the worst marketing a game has ever received. A brilliant shooter with a great script, Bulletstorm deserves more attention, in no small part thanks to the Boneduster, a four-barreled shotgun that will tear enemies in half at close range. Seriously, you get points for which half you explode. It’s awesome. The game’s creators at People Can Fly went a step further with their masterpiece, though. The gun’s alt-fire shoots all four rounds at once, with a devastating blast so powerful that it seems capable of killing every single enemy in the game. It can even shoot through cover. Like the Super Shotgun, it avoids the slow-and-therefore-cumbersome-and-unusable slowness of a lot of break-action shotguns. It’s a joy to use, and probably the single most vicious shotgun in shooter history. The HECU had it all. The range was delightful, the fire rate felt satisfyingly slow—rather than infuriating—and the 8-shell capacity with 125 rounds meant you had plenty of shots to fire without needing to reload all the time. I was disappointed that Half-Life 2 reduced the ammo count to force players to play with the gravity gun instead, because the HECU feels right every time you use it. When you hit something, it stays down. The SPAS does work. Plus, who could forget that distinctive spring sound when you reloaded it? Alright, alright, I know, this one sounds super weird, and that’s because it is. The Graal Spike Thrower is a shotgun that you can charge for more powerful attacks. Rather than pellets, it shoots a bundle of spikes. It likely has the greatest range of any of the other guns here, but that’s what makes it so fun. You can use it up close and personal as a shotgun, or you can charge up the shot to be more effective at further ranges. With two distinct niches, the Spike Thrower is a delight to use. It’s also probably the best charge-up weapon I’ve ever used in a shooter. Halo’s best shotgun was its first. For one thing, that puppy packed a hefty 72 rounds. That may be far less than F.E.A.R.’s 180 or Half-Life’s 125, but it’s still monstrous for a company that’s gone on to make shotguns with ammo ranging from a pitiful 15 to 36 rounds. While it has what is probably the shortest range of any shotgun on this list, Halo’s shotgun was great, because Halo is a close-range game. The Flood are the perfect targets for the shotgun, as one of Halo’s best levels, The Library, showed. Has there ever been such a perfect pairing of gun and enemy? No. Never. Nothing is more satisfying than shooting Flood with the M90 as you storm your way through gaming’s greatest gauntlet. Unfortunately, some video game shotguns aren’t so well designed. A poorly-designed shotgun has both a slow rate of fire and hits like popcorn at anything more than arm’s length. Bad gaming shotguns carry fewer than six rounds (and maybe 15-45 rounds in reserve). They’re pointless when used against AI, because they open the player up to a ton of damage without letting the player reciprocate or for very long. Their only advantage is that they can one-hit kill at melee range, but most games feature a one-hit-kill melee, rendering these poorly designed shotguns completely useless. The player is usually taking tons of damage and constantly reloading, rarely feeling effective beyond melee range. It doesn’t feel good at all. Because of this massive range reduction, poor shotgun design encourages shotgun-users to camp or ambush opposing players. This results in a lot of players dying from shotguns in just one hit, which results in cries to nerf shotguns. Nothing is less fun than dying to something without feeling you can fight back. Unfortunately, designers tend to think of shotguns as one hit kill machines, so the tendency is to reduce range even further, which simply encourages more camping or ambushing, because using the gun as a ranged weapon is no longer viable. This upsets players even more. Poor shotgun design often either results in players not using shotguns at all or doubling down on practices that make shotguns feel unfair to those who died from them, with constant cries for more nerfs. Good shotguns, as mentioned earlier, are decent close to mid-ranged weapons. Reducing range encourages more poor play. Increasing range, on the other hand, makes shotgunners feel more viable and encourages them to start running around. Keeping the single-hit kill range fairly low while making shotgunners feel effective at 20+ yards with slow, 2-3 hit kills means more dynamic, interesting play. A good shotgun should feel fun to use. If the shotgun’s drawbacks outnumber its strengths, then it’s likely to result in more stationary players, and the game becomes less fun. A good video game shotgun pulls its users into exciting fights.